The last post was about Socially Optimal Solutions and the Nash equilibrium. In this post, we examine traffic patterns under the same lens. It appears bad traffic situations might be avoided if road users a) play by the rules or, b) play fair or, c) are trusted by other participants. 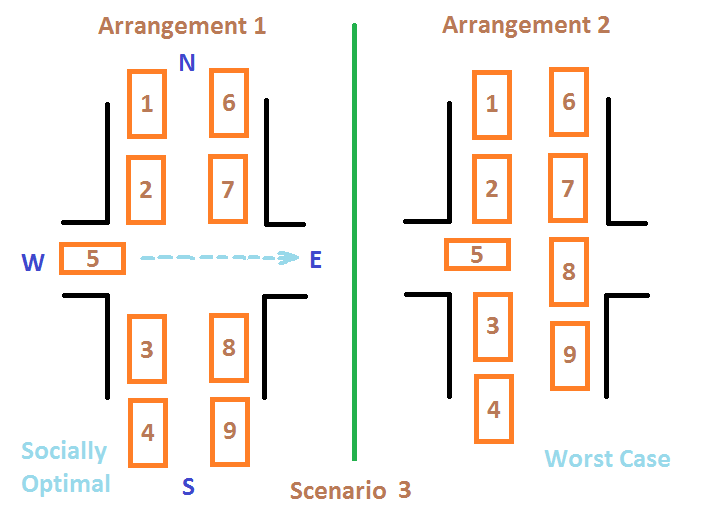 In Scenario 1, the North-South traffic is waiting for the light to turn green. Cars 1 and 2 are going South. Cars 3 and 4 are going North. 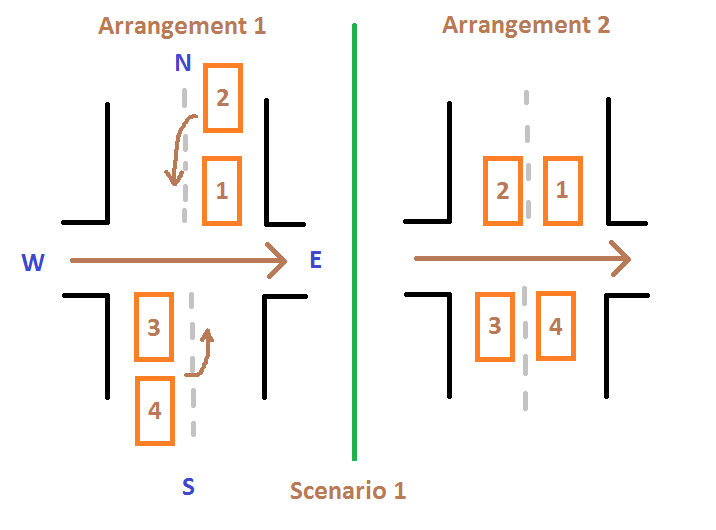 Now, if the drivers of Cars 2 and 4 try to cheat by overtaking on the wrong side of the road, you could end up with Arrangement 2 (everyone is blocked). 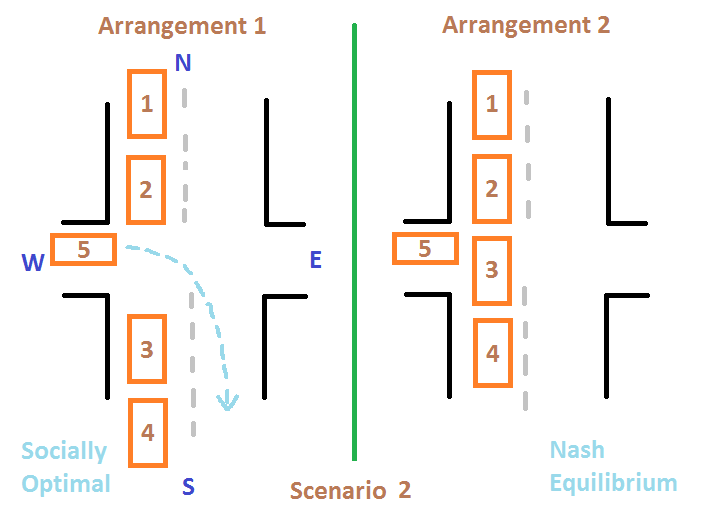 This is what you would get at the Nash equilibrium assuming that there were no policemen at the intersection (the Nash equilibrium is one of many possible equilibriums that can be reached if people don’t cooperate, but just act in their own self-interest). So, it is only if the drivers all respect the law, without any trying to cheat, that they would end up with the socially optimal solution (Arrangement 1 rather than Arrangement 2). Here, the intersection does not have traffic lights. The North-South traffic has stopped. Cars are accumulating in the North-South road, and so Cars 1, 2, 3 and 4 are not going anywhere. Now, 3 can choose to leave a gap for 5 to pass through. The game here is between Cars 3 and 4. If Car 3 feared that Car 4 might try to overtake by taking advantage of the gap, it would move forward and block the intersection. So, in this case, an expectation of unfairness could lead to a solution that is not socially optimal. And that would be the Nash equilibrium. However, if people considered each other to be fair, there could be a socially optimal solution that is better than the Nash equilibrium. No traffic lights. There are two lanes going in the same direction (South to North). Traffic is stalled in the North-South direction (Cars 3, 4, 8 and 9 are going nowhere). Cars 3 and 8 have the option of leaving a channel open for Car 5 to pass through. What’s interesting here is that if Car 3 suspects that Car 8 might close the intersection, Car 3 would do well to close the intersection itself (preventing Arrangement 2). Again, that would be the Nash equilibrium. However, if everyone agreed and cooperated to keep the intersection open, you would get a much better result (a social equilibrium) than you would with the Nash equilibrium. So, the socially optimal solution is obtained only if there is strong mutual trust between the participants in this traffic pattern game. I find these traffic patterns interesting because they could be indicators of local ethics. When you visit a new place, you might be able to get an idea of how fair, trustworthy and rule-abiding the local people are, just by observing the traffic? This lovely video tells you about the concept of a Socially Optimal Solution – a solution that works very well for society – and why such solutions are often not stable. It also explains the concept of a Nash Equilibrium – a solution that is stable, but not always optimal for society. It also tells you how aggressive competition can lead to results that are not optimal for society. When we started writing the Aiaioo Labs blog, I’d written an article “An echo of voices” on how Tamil, a South Indian language, is phonetically similar to Dyirbal, a native Australian language. Now, a genetic study seems to have found some evidence of migration from India to Australia some 4000 years ago. I still haven’t had the opportunity to learn any Australian languages. I can’t wait to do so. In our first blog post of the year, we’d like to share a talk by Kevin Slavin. It was about algorithms to combat poverty. We also wrote about how math might someday shape our values.